1 perspex window , plain trims, piano safety hinge, diamond in door, manufactured to British and European safety standards. 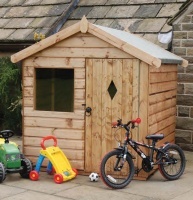 Our entry level play den is available in a single size and is constructed with all our standard safety features. All sections including the floor and roof are fully tongue and grooved.